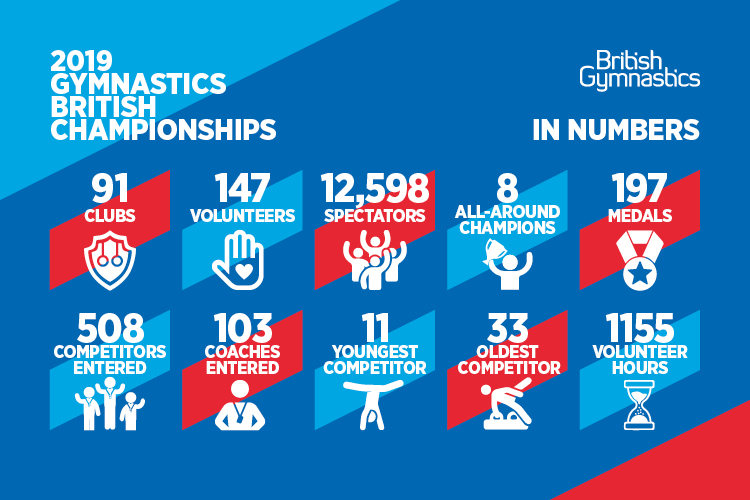 The 2019 Gymnastics British Championships have concluded in Liverpool, with the men’s masters and senior women’s apparatus finals providing the perfect end to a brilliant four days at M&S Bank Arena. 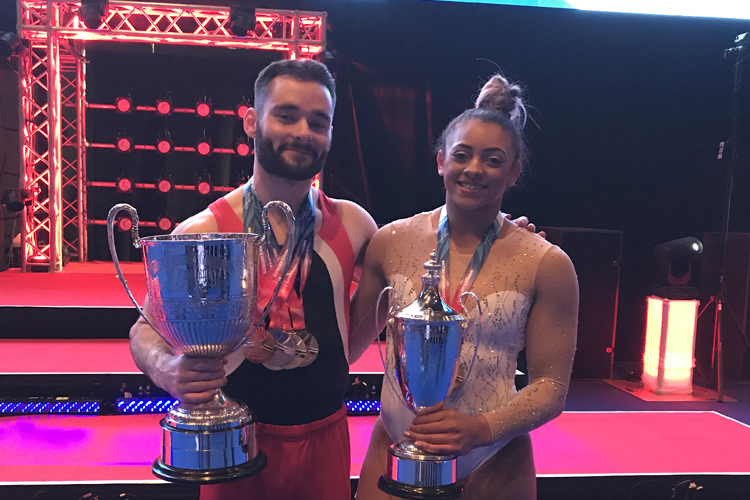 In the senior women’s apparatus finals Ellie Downie from Notts and Georgia-Mae Fenton both won two titles apiece. Starting on vault, Ellie Downie from Notts dominated the final, averaging 14.325 which included a double twisting Yurchenko on her first pass. Taking silver was Phoebe Jakubczyk from The Academy with two impressive vaults with little movement on either landing for 13.200. Megan Bridge from Gymmagic claimed bronze with a score of 13.125. On uneven bars, Georgia-Mae Fenton from East London took the title with a massive 15.000. Linking the elements brilliantly, the difficulty was packed in to her routine. Alice Kinsella from Park Wrekin scored 13.950 for silver and winning bronze was first year senior Amelie Morgan from The Academy with 13.800. Georgia-Mae also took the title on beam after a near flawless routine. Up last in the final, she had the slightest of hops on her dismount for a score of 13.800. Jessica Daykin from Wiltshire School of Gymnastics has had a brilliant few days in Liverpool and topped it off with silver on beam (13.350). Amelie ended her first senior British Championships with her second bronze of the day, scoring 13.100. In the floor final, Ellie wowed the crowd with a stunning routine. Opening with an immaculate double-twisting double-back, Ellie’s score of 14.200 secured her second gold of the day. It was a close fight for gold though with GB teammate Claudia Fragapane from Bristol Hawks. 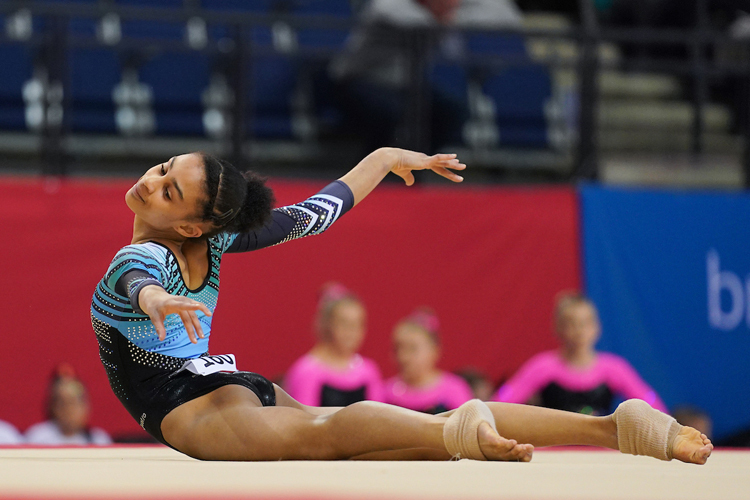 Claudia demonstrated why she is a world medallist on floor, scoring exactly the same as Ellie with 14.200, having to settle for silver due to Ellie’s execution score being higher. In bronze was City of Birmingham’s Taeja James who performed well for 13.950. 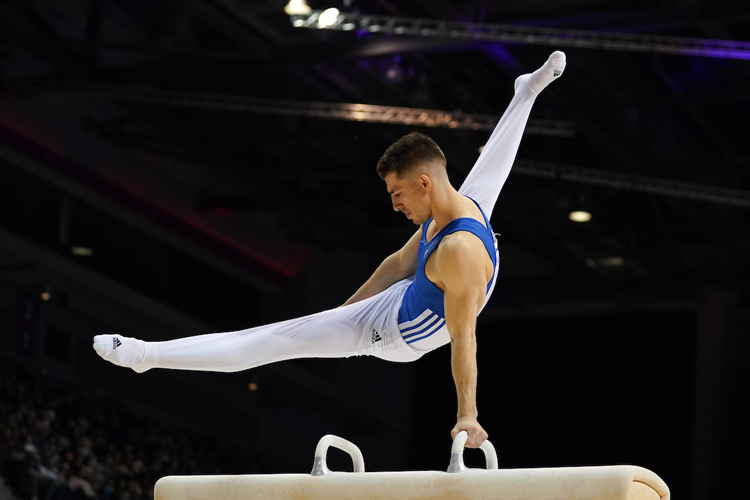 In the men’s masters (which sees the topped ranked junior and senior male gymnast go head to head on each apparatus) Giarnni Regini-Moran impressed on floor to win gold with 14.250. Having won the apparatus title on floor just yesterday, his powerful tumbling was again on display as he packed in the difficulty. Under 18 all-around champion Jake Jarman from Huntingdon qualified for the masters floor final on Thursday and didn’t look out of place against the senior gymnasts, scoring 14.075 for silver. Adam Steele from Pipers Vale, a guest at these Championships but eligible to compete for medals in the masters, won bronze with 13.550. In the pommel final it was no surprise to see Max Whitlock MBE from South Essex top the scoring. He really is a master of the apparatus, scoring 15.000 to take the title. Adam Steele picked up his second medal of the day, scoring 13.750 for silver, with James Hall (13.075) from Pegasus counting a fall but recovering well for bronze. James then took the rings title with good control and a near perfect landing for 13.825. In second was first year senior Jamie Lewis from Woking, scoring 13.650, with Pavel Karnejenko from Notts taking home bronze (13.400). On vault, it was Jake who came out on top, averaging 14.675 for his two vaults, the first of which was an impressive triple twisting Kazamatsu. Giarnni (14.375) took silver, competing two vaults of high difficulty, with Pavel Karnejenko from Notts scoring 14.187 for bronze. Joe Fraser from City of Birmingham won gold on parallel bars with a dominant display. On one of his favoured pieces, he scored 14.525 to take the title. Giarnni was back in the medals, winning silver with 13.925, and Max Whitlock MBE, competing this weekend on parallel bars for the first time since the Rio Olympics, scored 13.725 for bronze. 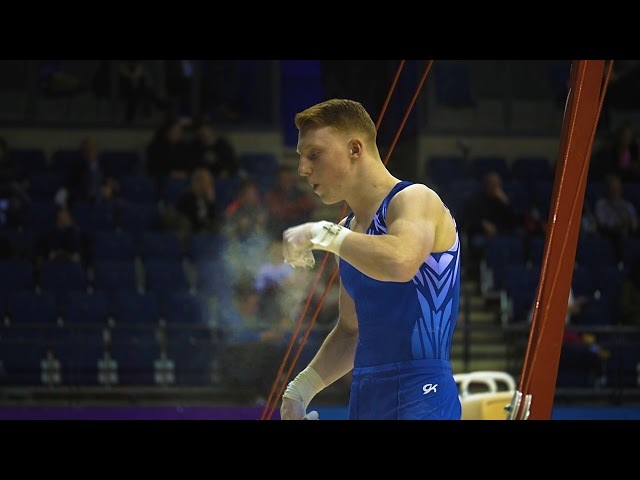 In a tense high bar final, Joe Fraser included three big release and catch elements which helped him to a score of 13.350 and gold. In silver was Josh Cook from YMCA Barry who scored 12.650, and Matthew Boardman from Notts, despite having to a count a fall, showed good composure to finish his routine and take bronze with 11.650. 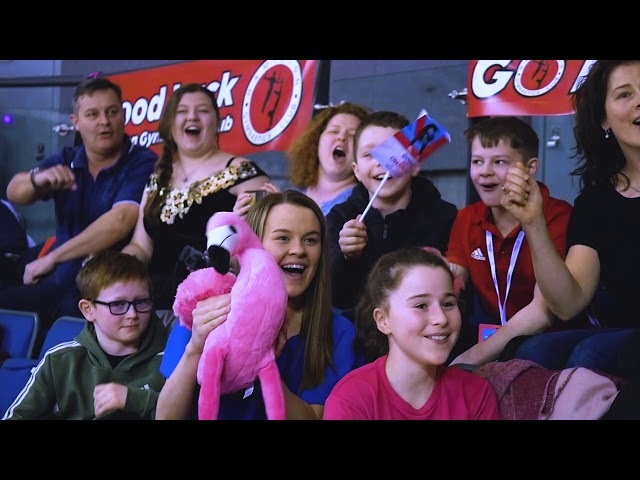 Earlier in the day, junior and disability apparatus finals took place. Read more.